Game developer PixelBite believes traditional console and PC games work great on mobile devices like the Nvidia Shield Tablet. Game developer PixelBite believes traditional console and PC games work great on mobile devices like the Nvidia Shield Tablet. 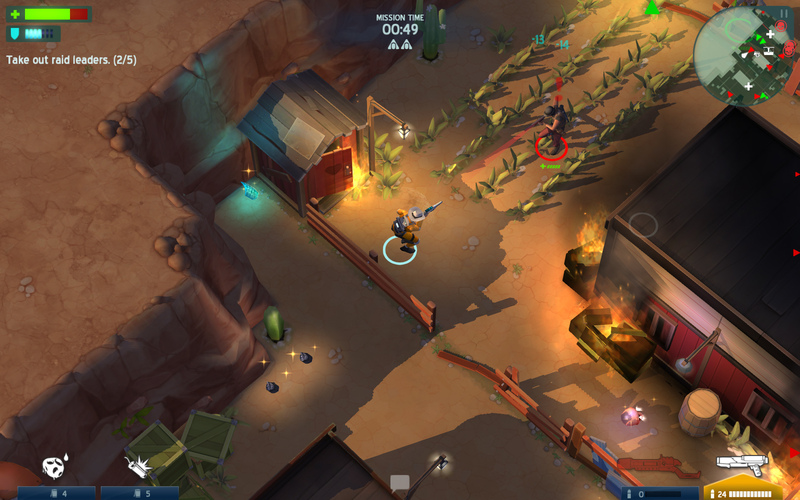 The new tactical shooter, Space Marshals, has been designed for Android devices and optimized to take advantage of Nvidia Tegra K1 technology. Mattias Olsson, managing director at PixelBite, talks about the new mobile game in this exclusive interview. Our grand master plan with Space Marshals was to try pushing the boundaries on what a mobile or tablet game was supposed to be and, also, to make a game that didn’t have cars in it. (Don’t get me wrong, we still love racing games, but it is nice to do something different once in a while!) Basically, we want to bring gameplay mechanics from more traditional gaming platforms to mobile, and to make it work. How are you blending genres with Space Marshals? We’ve been big fans of tactical combat, stealth and role playing games for a long time. So the gameplay concept, theme and story grew organically during the preproduction phase. Most importantly, the gameplay experience had to be spot on and the visuals had to stand out. We spent months researching and prototyping different input schemes and enemy behaviors to get the feeling just right. It’s so abstract and objective. It’s very hard to capture. How happy are you with the final game? Even though as a developer you’re never done – there’s always so many things you want to add, fix or tweak – in the end we landed pretty close to what we were aiming for with Space Marshals. Our protagonist, former Space Marshal Burton, and his companions get reinstated as Space Marshals to hunt down the most vicious fugitives in the galaxy after a major prison break. They happened to be held in detention cells in the very same prison. The team consists of a, hopefully likable, bunch of misfits that have gotten into trouble with the law themselves, one way or another. T.A.M.I the sarcastic A.I. runs the team and bullies them to do their missions and eat their oatmeal. Can you talk about the gaming experience and how it utilizes tablets like Nvidia Shield Tablet and smartphone functionality? The game feels and plays great with a game pad. No matter how optimal your controller scheme is on touch; if it’s an action game and it has buttons then a gamepad is hard to beat. Compared to the many other Android gamepads out there Nvidia Shield feels really solid and precise. It’s like playing on a console. What does your game brings new to the genre? We’re not entirely certain what genre Space Marshals belongs to. We pick features and aspects from quite a few genres and different formats, such as turn-based tactical combat games. There are also some obvious parallels with dual stick shooters, but compared to Space Marshals the pacing is very different. You can’t solve all situations by rushing in guns blazing. Stealth and tactical approaches often works out best. We’re just a small independent studio with 11 developers. For us to be able to create competitive games and be able to reach such a broad audience is fantastic. A few years ago this would have been almost impossible. It’s all been because of the constantly growing and evolving mobile gaming sector. That and also the rapid development of the hardware is astonishing. We’ve been through similar, but slower, progression on the PC and console side earlier in our careers. Now, each game we develop can push our visions further. Space Marshals wasn’t just a big stepping stone in evolving our technology but it was also our first game that wasn’t a racing game. There were many new aspects of game development for us, such as story and dialog, character development and new ways of designing levels, just to mention a few. We’re learning new things every day. It’s been and still is a great experience. How do you see Android TV opening up new opportunities for game developers? It’s obvious the gap between “stationary gaming” and “mobile gaming” is closing. The next logical step would be a fusion between the two. Cross platform has been around for years, with various successes, but Android TV is something else. Android TV will bring the Android ecosystem to your living room and it will be just one platform. This will enable Android developers to reach a new target audience with one and the same App. Of course, there are always user interface adaptions and some considerations to be taken when supporting a larger screen, but if you are already supporting gamepad input this step isn’t huge. Flight simulator developer Laminar Research has brought the high-end, realistic flight simulator game, X-Plane, to NVIDIA mobile devices and NVIDIA Shield TV.